"I don’t have children. Not because I didn’t want to but because that’s just how things turned out in my life. I believe the universe knows how badly I wanted to become a parent because I now have hundreds of children. They are all young black men who attend Morehouse College, the ones I’m closest to have aspiration of becoming doctors, dentists, pharmacists, veterinarians and researchers. These young men are absolutely brilliant. They worked hard to get to Morehouse College and work harder each year they are enrolled. They ALL aspire to attain post graduate degrees of some kind. I just took 34 of them on a trip to a medical school in North Carolina where they met with medical students and other professional staff, some from Morehouse College, some who just gave of their time. My students asked meaningful poignant questions that reflected that each of them has a future of giving back to their communities. Every day I am amazed by the perseverance, dedication and discipline of each of these young men. Moreover, I give reverence to their parents for dedicating their lives to raising these amazing human beings. The HARDEST thing to do in this country is raise a black man and the mothers and fathers who are able to successfully get them through high school and into college should be revered. Trayvon Martin wanted to learn how to fly and attended aviation school to fulfill that dream. My godson received his pilot’s license at 17. Trayvon could have done that. Math was Trayvon’s favorite subject, he was a thinker, he could have been a math major, he could have attended Morehouse College. He loved to build things and was an A/B student there’s no telling where his young life could have gone. 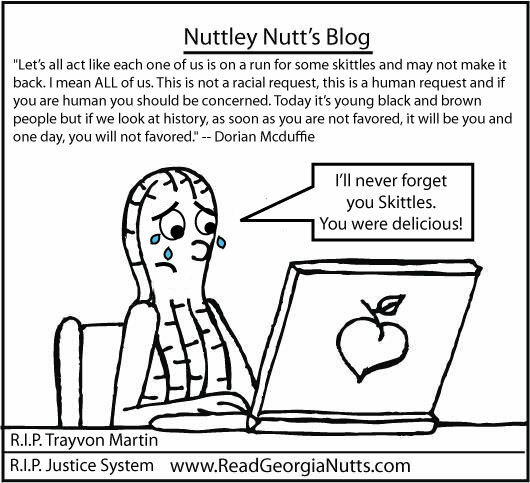 I grieve you Trayvon. I grieve you in name of all of my friends who are raising young men. I grieve you for all of my friends who have raised their sons and have sent them out into this frightening world. I grieve you for my father, brother, uncles, cousins and godson. I grieve you for the hundreds of young black men that I see working into the night at Morehouse College whose sole aspiration is to make the world a better place. The politics of this verdict is not new, we can list tens of young black men stolen from us with no repercussions for the thief. Perhaps is because the spotlight on the case made transparent the obvious injustices in the system. Perhaps it’s because we have been fooled into thinking that because there were enough right minded people in this country to vote in the right president, that fairness and common sense prevails. Let’s hope that this serves as a wake up call. Let’s all act like each one of us is on a run for some skittles and may not make it back. I mean ALL of us. This is not a racial request, this is a human request and if you are human you should be concerned. Today it’s young black and brown people but if we look at history, as soon as you are not favored, it will be you and one day, you will not favored. All belief systems operate with basic Karma as their premise. Western culture interprets Karma as “what goes around comes around.” While I don’t believe that is solely what should fuel one’s duty to do the right thing, it should certainly be a reminder to always act with integrity in thought and deed. What’s hardest for me to fathom is that six mothers decided that Trayvon’s life was not worth honoring by punishing this latest life thief. I know the compassion of mothers, I was on the phone with one when the verdict came down who was sobbing because of the kind of world she has to raise her sons in. I would ask that each of you reading this do something to honor Trayvon. Have the conversation with your children, speak with all of the young people in your life. Speak with someone that may not see the verdict the way you do, gain understanding. Donate to the Trayvon Martin foundation. Organize or participate in a rally. Please don’t let this go away with the next news cycle, because that begins tomorrow.